Even as snow falls, officials in Guymon are doing damage assessments after a wildfire that forced residents on the town’s south and west sides to evacuate. Texas County emergency management director Harold Tyson said Monday morning that the fire destroyed one home and at least two businesses near the Oklahoma Panhandle town. He says it also damaged an undetermined amount of outbuildings. 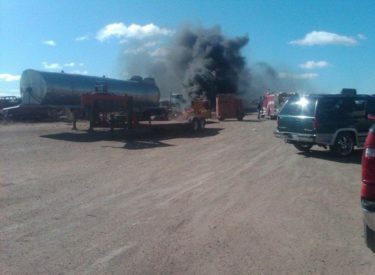 Tyson says the fire started Sunday about six miles west of Guymon on U.S. Highway 54, which was closed for about 5 1/2 hours as crews fought the blaze. Firefighters now are working to mop up areas where the fire is trying to rekindle. He says snow fell in Guymon on Monday morning and winds are gusting above 30 mph. Much of Oklahoma remains under a wind advisory Monday.